The district of Lytham and St Annes have always had a character distinctive from that of their northern neighbour on the Flyde Coast, Blackpool. 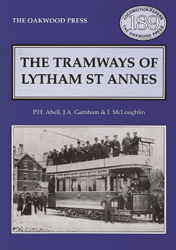 This is the story of a part of that distinctive character: the tramway history of the twin towns diverged from that of Blackpool from the start, with the courageous decision to employ gas trams powered by the internal-combustion engine, which was to come to dominate passenger transport in the 20th century after the false dawn of the Edwardian tramway boom. A5 format, 128 pages, more than 170 photographs, plans, etc..